A 70yr old Hispanic male with presents with history of disseminated coccidioidomycosis diagnosed in 2004 with progression of disease in 2016 with basilar meningitis requiring ventriculoperitoneal shunt. He has been on Voriconazole 200mg BID since June 2016, and has had therapeutic Voriconazole levels since 8/2016 (ranging 2.6 – 5.1). Admitted February 2018 for acute on chronic weakness occurring after a fall 2-3 months ago where he lost coordination and tripped over a table. Noted joint pain over L shoulder, L elbow and 2nd and 3rd L metacarpals. He describes the pain as an aching sensation with stiffness and is no longer to extend his elbow fully and he now requires assistance with walker for ambulation. ROS is notable for no headache, neck pain, fever, chills or weight loss. Of note, he had outpatient evaluation 10/2017 for lytic bone lesions including biopsy of L iliac bone and bone marrow biopsy which were inconclusive. Electrolytes and hematology values were normal. Plain films of shoulder, elbow and hand: Diffuse osteopenia with mottled appearance, endosteal scalloping involving shoulder and elbow. Hand film notable for radiodensities over soft tissue of second and third digit and periarticular osteopenia. Hospital course: The patient was maintained on voriconazole. Lumbar puncture was performed and was notable for: WBC 4, Glucose 91 (CSF:Serum ratio 0.38) and an elevated protein level of 262. Coccidioides serologies from serum and CSF were obtained, and were both downtrending (Serum 1:32 and CSF 1:16) from previous studies. 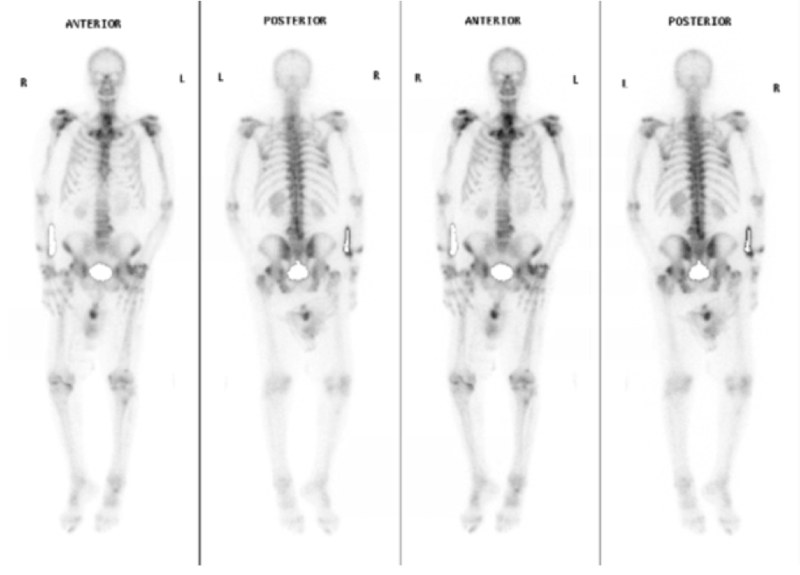 Imaging demonstrated periosteal reaction with osteopenia and bone mottling, with elevation of alkaline phosphatase. Question: What is the cause of this patient’s musculoskeletal findings and how would you confirm the diagnosis? Fluoride is absorbed and transferred to bone, creating a crystal structure called fluorapatite. This then stimulates osteoblast activity; however, when fluorapatite integrates into the bone, the bone structure becomes resistant to resorption. This leads to increased bone density, osteosclerosis, bone pain and increased susceptibility to fractures. Patients often present with skeletal pain most commonly involving the chest, ribs, arms, forearms and less commonly hips and lower extremities. Pain can improve 2-20 weeks after discontinuation of Voriconazole therapy. Voriconazole drug levels do not always correlate to patient’s fluoride level, due to differences in fluoride metabolism. Diagnosis can be difficult to determine based on imaging alone, bone scans are frequently positive if pain is present and localizes to the described area of pain. Our patient was transitioned to Itraconazole, a nonfluorinated triazole, to continue his life-long therapy for disseminated coccidioidomycosis infection. His pain improved over the following 6 months. The patient’s laboratory values (alkaline phosphatase and fluoride level normalized over the following 6 months). Wermers RA, Cooper K, Razonable RR, et al. Fluoride excess and periostitis in transplant patients receiving long-term voriconazole therapy. Clin Infect Dis. 2011 Mar 1;52(5):604-11. Thompson GR, 3rd, Bays D, Cohen SH, et al. Fluoride excess in coccidioidomycosis patients receiving long-term antifungal therapy; an assessment of currently available triazoles. Antimicrob Agents Chemother. 2012;56:563–564. Moon WJ, Scheller EL, Suneja A, et al. Plasma fluoride level as predictor of voriconazole-induced periostitis in patients with skeletal pain. Clin. Infect. Dis. 2014; 59(9): 1237-45. Skiles JL, Imel EA, Christenson JC, et al. Fluorosis because of prolonged voriconazole therapy in a teenager with acute myelogenous leukemia. J Clin Oncol. 2011;29:e779–782.